The Leesa foundation is specifically designed for Leesa and Sapira mattresses with perfectly spaced slats, a beautiful upholstered finish and made in America materials. It took me about 30 minutes to assemble, but I was also filming which slows me down by about half or so. Assume that assembly will take you 10-15 minutes. It is really easy as long as you make sure that you align the corners properly. The Leesa foundation carries on the beautiful design found in The Leesa and Sapira mattresses as well as the pillows and of course the Leesa Blanket. Who Should Buy the Foundation? What is Inside the Foundation? (1) Queen size or larger will have an additional support beam which goes down the center. Assembly is pretty simple, and should take less than 15 minutes. You align the four corners and then place a peg to join each corner. If the foundation is for a queen size or larger you slide the support beam in the middle. Lastly, you unroll and place the slats. There are three things to look out for when assembling the Leesa foundation. In each corner there are three interlocking rings, which need alternated with the three rings on the other piece of the foundation. Each of the side pieces has a little indent where the slats will fit into it. Make sure that they are towards the top of the foundation. If the foundation is Queen size or larger you will have a support beam. It slides from the top down, so if you see metal at the top you need to switch the foot and head beams around. It looks great and matches the rest of the Leesa products. Now you are asking, how does it perform? You can see on my video below that I am able to walk on it without any issues, although I don’t encourage you to do that! 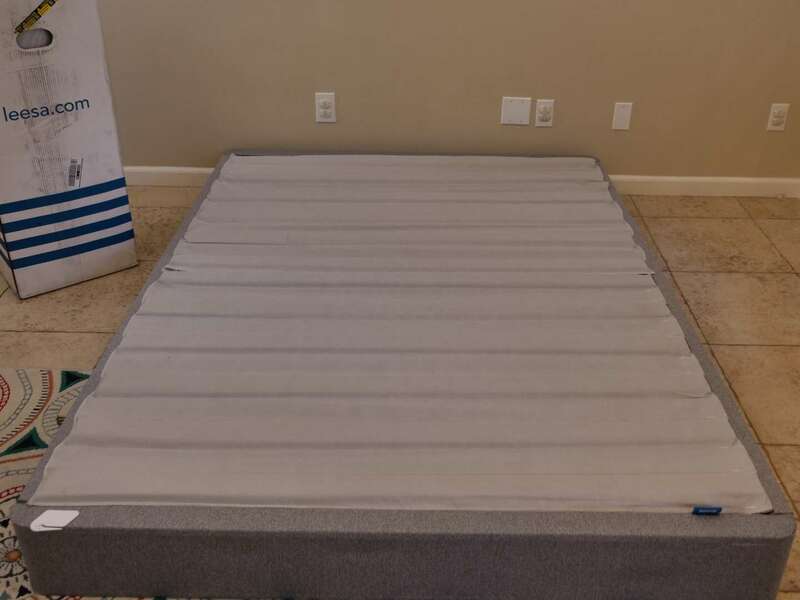 When sleeping on it (well the mattress on the foundation) I couldn’t feel any bumps or ridges. The base is solid and does what it is designed to do. I typically sleep on an adjustable base, and this is not compatible with one, nor would you need one if you had an adjustable base. 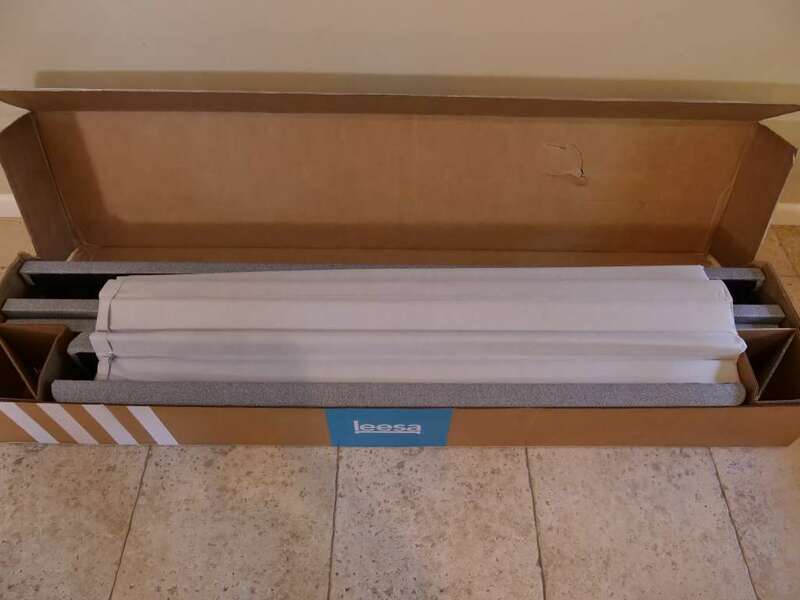 The Leesa Foundation is a huge step up from putting your mattress on the floor and a large step up from the old style box springs. Box springs are flimsy and don’t ship to you in an easy to assemble/disassemble and move fashion. I’m going to cut open a box spring and show you the difference, but it’s pretty far down on my video shooting schedule, so you will have to check back in a while. • Easy to move, just take off the slats, remove the center insert, pull the 4 pegs and reassemble in your new house. People who like one stop shopping should consider the Leesa foundation. 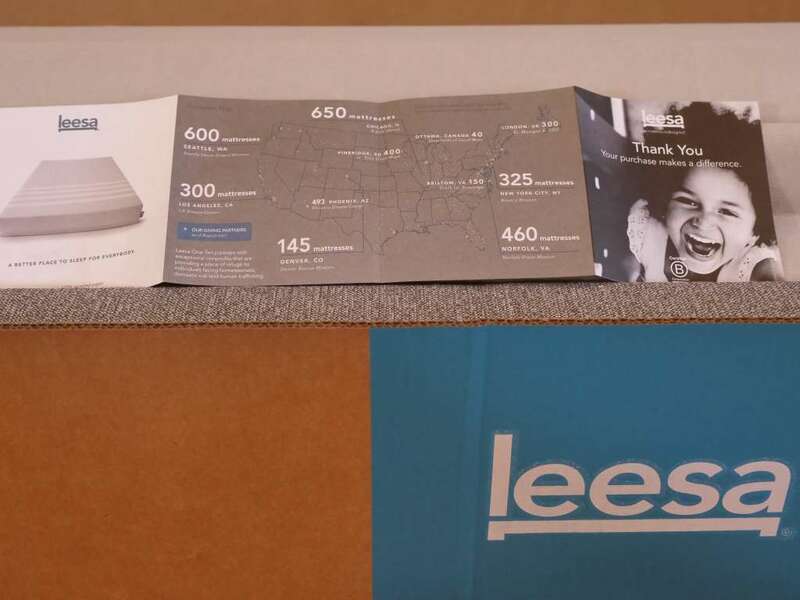 Leesa is currently offering $160 off a mattress. Can you put this foundation on a bed frame? Yes, I had it on my spare bedroom frame for awhile.